1 Place squash cut-side down in a microwave-safe dish; add water. Microwave, uncovered, on High until the flesh is tender, 10 to 15 minutes. 2 Meanwhile, position rack in upper third of oven; preheat broiler to high. Line a rimmed baking sheet with foil. 3 Place chicken on the prepared pan and season both sides with five-spice powder and salt. Broil, turning once, until an instant-read thermometer inserted into the thickest part registers 165°F, 5 to 8 minutes per side. Transfer to a clean cutting board. 4 Toss bok choy with 1 tablespoon oil in a large bowl. Transfer to the pan and broil, stirring once, until lightly charred, about 3 minutes total. 5 Whisk the remaining 3 tablespoons oil with tamari, lime juice, peanut butter, brown sugar, ginger and garlic in the bowl. Reserve ¼ cup of the sauce. Scrape the squash from the shells into the remaining sauce and stir gently to combine. 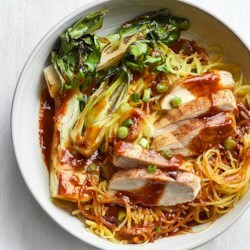 6 Slice the chicken and serve with the squash, bok choy, reserved sauce and scallion.